We’d love your help. Let us know what’s wrong with this preview of The Big Game by Sandy Schofield. When Quark holds a poker tournament on Deep Space Nine someone from almost every sentient race -- Klingons, Cardassians, Romulans, Vulcans, Ferengi -- shows up for what is sure to be the highest-stakes game of all time. But when one player is killed, the stakes get higher than even these big-money players had counted on. With the station rocked by subspace waves that threat When Quark holds a poker tournament on Deep Space Nine someone from almost every sentient race -- Klingons, Cardassians, Romulans, Vulcans, Ferengi -- shows up for what is sure to be the highest-stakes game of all time. But when one player is killed, the stakes get higher than even these big-money players had counted on. To ask other readers questions about The Big Game, please sign up. With the third original book in the Star Trek: Deep Space Nine series, I'm shocked to have to type, for the third time, there's a killer on the station and Odo has to stop him. Yes, I sighed loudly. The good thing about The Big Game is it is a quick read. The characters are fairly in character with some minor discrepancies that are easy to overlook. It moves along at a great pace and it's fun how some of the one-shot and minor Next Gen characters are shuffled into the mix. The cause of the space With the third original book in the Star Trek: Deep Space Nine series, I'm shocked to have to type, for the third time, there's a killer on the station and Odo has to stop him. Yes, I sighed loudly. The cause of the space disturbances and the fix is a major drawback of the book. While it's an interesting idea it isn't practical within the Star Trek universe. There's a mistake in the digital copy I read that had Odo in Ops and Quark's at the same time. I had to go back because I thought I missed something. I think "Odo" replaced "O'Brien" in the text. There's quite a bit in this novel that I find irritating: (1) the book accentuates too many early first season characteristics that were quickly toned down; (2) there are far too many gratuitous cameos (Rasmussen...really? ), and many of them come far too soon after recent cameos in the TV series; (3) the murder plot is so suddenly switched with the Ghost Rider plot that whiplash is the result, and you might be forgiven for thinking you've started another DS9 novel. Luckily, there is also more th There's quite a bit in this novel that I find irritating: (1) the book accentuates too many early first season characteristics that were quickly toned down; (2) there are far too many gratuitous cameos (Rasmussen...really? ), and many of them come far too soon after recent cameos in the TV series; (3) the murder plot is so suddenly switched with the Ghost Rider plot that whiplash is the result, and you might be forgiven for thinking you've started another DS9 novel. I wanted to toss it out the nearest airlock. Boring writing style. Unengaging plot. A poker game, really? I listened to this book during my commute. It's a fun, if not a little slow, Deep Space Nine story that takes place sometime during the first season of the show. This early date is an endearing part of the book. The crew doesn't yet fully know or even like each other, which is true to season one of the show. And like watching a TV show's Pilot episode, the novel contains a few small details which don't quite match the show after it had been on the air for a little while and settled into it's own I listened to this book during my commute. 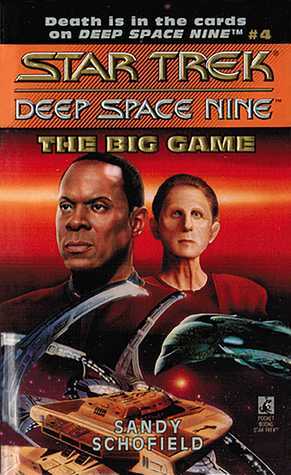 It's a fun, if not a little slow, Deep Space Nine story that takes place sometime during the first season of the show. This early date is an endearing part of the book. The crew doesn't yet fully know or even like each other, which is true to season one of the show. And like watching a TV show's Pilot episode, the novel contains a few small details which don't quite match the show after it had been on the air for a little while and settled into it's own groove. To me this wasn't a bad thing. It was kind of fun to catch the discrepancies as I listened..
For example, in the book Commander Sisko drinks coffee and cappuccino instead of Klingon raktajino, which became a consistent part of his character in the later seasons. Rom doesn't come across as good-natured and a little slow on the uptake. Instead, he's just another greedy Ferengi. And also, at one point Odo changes his form to have a civilian attire and Quark supposedly realizes that he has "never seen" Odo in anything but his beige Bajoran uniform. This little detail doesn't match later seasons of the show, in which Odo's past Cardassian uniform is shown (it's not beige), meaning Quark would have seen him in it all the time. This book is also a whodunit with a large cast of supporting characters. Admittedly, early scenes were a little slow as all of the new characters were being introduced, but I was pleasantly surprised by how the tempo of the book picked up as the story unfolded. There was a shift in focus away from the whodunit which weakened the ending, unfortunately. An enjoyable TREK novel so long as you don't mind the entire poker tournament aspect being relatively pointless. I'm guessing the authors simply felt like writing about poker and were dead-set on doing so, regardless of whether the plot actually called for it. And just to make things more confusing for the uninitiated, they go with Texas Hold 'Em instead of traditional five-card stud. The novel is credited to Sandy Schofield, which is a pen name for husband-and-wife writing team Dean Wesley Smith An enjoyable TREK novel so long as you don't mind the entire poker tournament aspect being relatively pointless. I'm guessing the authors simply felt like writing about poker and were dead-set on doing so, regardless of whether the plot actually called for it. And just to make things more confusing for the uninitiated, they go with Texas Hold 'Em instead of traditional five-card stud. The novel is credited to Sandy Schofield, which is a pen name for husband-and-wife writing team Dean Wesley Smith and Kristine Kathryn Rusch. Under the Sandy Schofield name, they also wrote a couple of QUANTUM LEAP and ALIEN/PREDATOR novels. Their PREDATOR novel was also titled BIG GAME, making "Sandy Schofield" the only author I know of who published two completely different novels under the exact same title (plus or minus the word "the"). Although the titular poker tournament is really just an excuse for Quark and Odo to have a lot of amusing interactions with each other, the other main storyline is actually pretty ambitious, positing a sort of alternate universe in which beautiful spirit creatures are hunted down like whales. The book hints that these story elements were first introduced back on STAR TREK: THE NEXT GENERATION, but I can't find any evidence that such is the case. how is this another murder mystery....how.... the first 3 original DS9 books are all murder mysteries. This one was better than the last one at least - more fun character interactions, more of a plot, etc. but it was still pretty mediocre. Also the book is clearly written by two people in that the plot is TOTALLY random - the murder mystery 100% randomly drops off midway through and then the plot becomes a space alien hunter thing. At least the second half is more enjoyable? That made it pick up how is this another murder mystery....how.... the first 3 original DS9 books are all murder mysteries. This one was better than the last one at least - more fun character interactions, more of a plot, etc. but it was still pretty mediocre. Also the book is clearly written by two people in that the plot is TOTALLY random - the murder mystery 100% randomly drops off midway through and then the plot becomes a space alien hunter thing. At least the second half is more enjoyable? That made it pick up for me at least and helped me finish it. People comment on it being dumb that there's a poker game at the center of the plot but come on, poker was huge in TNG and while it IS idiotic that apparently every alien race plays poker (????) it is a fun enough plot device and works in the book. verdict: skippable. It's close to being enjoyable but...it's skippable. Kind of tepid, but worth reading just to be in the world of Deep Space Nine. It reminds me a lot of the tepid episodes of the television show. They probably have to have a lot of these because they don't know until they are done and broadcast if it is a tepid, good, or a great episode. The same is true of the books. And I do watch and watch over and over all of the episodes of the show. I will probably do the same with the books. They each have their moments. This DS9 book has a high-stakes poker game, a murder mystery and a phenomena that threatens to catapault the station into war with the Cardassians...yet the execution is poor and the result is a book that is just okay. Better than I had expected it to have been. Better than 3,for sure. Some things were out of character but I enjoyed going back and forth between the two story lines. Very entertaining. A fun, quick read. Delved into the goofy aspect of DS9 that a lot of people loved. I always liked various aliens and wacky characters, so this one worked well for me. I am still trying to work out when I actually began to watch Deep Space Nine, and who it was that introduced me to the series. I have a feeling that I did begin watching it about the same time when it first aired on television. Looking back at the year of release (and remembering that Star Trek was generally released in Australia about a year after the US release) it puts me at adult re-entry college. So, this was after my time in the State Library and before the Fungus years (Fungus was the name of my church youth group). This means that DS9 was released in the time between when I knew the two Michaels (who are both big Trekkies), that is after I lost touch with the older Michael and before I met the younger Micheal. For some reason I also picked up and read a number of the spin-off books that were released (such as this one). I vaguely remember watching the Babylon 5 pilot episode, and I suspect that it was leant to me by one of Stewart's friends. When I first watched it I thought it was okay, and then handed it back. Around the same time DS9 was released and I began to watch that, and for some reason became drawn to it. So, putting the start in 1993, the end would have come around 2000, meaning that I was watching, and being entertained by it, during the Fungus Years. As for the books, I do remember reading them, but I simply do not know how I got my hands on them. Maybe I simply bought them, and then tossed them a lot later when I was no longer interested in them. Anyway, this book is about a poker game that Quark holds, and people come from all over the Federation (and beyond) to play. However, surprise, surprise, they simply could not help throwing another killer onto the station and have Odo track him down. Also throw in some subspace waves that are threatening the station, and you come up with a mediocre book designed only for die hard trekkies. There are some things that I wonder though, and one of them is gambling. All of the sudden, outside of the Federation, we have money and we have gambling coming back into the mix. It is almost as if they had to reintroduce the concept so that they could create more interesting stories and adventures. In one I recently watched we had a auction with a bunch of very wealthy people coming to participate. But there is no wealth in The Federation, so what gives? These wealthy people no doubt have to come from outside. The earliest-released Trek books always tend to be rushed out too soon, and have the highest chance of not being within the continuity of the show. This is primarily because the characters still haven't been fleshed out well enough for outsiders to be writing about them. And in some cases, even the show isn't fully fleshed out. This book has two things going against it. One is character differences. It's little things, but noticeable when you're a big fan of the show. Rom calls Quark "Quark" inst The earliest-released Trek books always tend to be rushed out too soon, and have the highest chance of not being within the continuity of the show. This is primarily because the characters still haven't been fleshed out well enough for outsiders to be writing about them. And in some cases, even the show isn't fully fleshed out. This book has two things going against it. One is character differences. It's little things, but noticeable when you're a big fan of the show. Rom calls Quark "Quark" instead of "brother", for one example. While he does say Quark on occasion in the actual show, it's a rarity, while in this book he never calls Quark "brother" at all. Nitpicky, but it's just one of quite a few examples. The second problem is overwriting to fill space. In multiple places characters just keep repeating themselves to each other just to make the chapter longer. It makes the characters look a bit stupid, to be honest. It's not a good look, especially when it's smart characters like Sisko or Odo. The overwriting extends itself to "explanations" as well. It spends way too much time on a scene where Quark is explaining how to play the card game to Odo, where Odo spends the entire time telling Quark over and over how he's "read how to play already", and the end of the scene has no payoff where Quark shows up Odo, it just kinda dies off. Neither the Cardassians nor the Bajorans are shown to have any sort of ability to think as well. Every contact with them is them griping that the other is attacking them with Sisko repeating (ad nauseum) that that's not what's happening. Incredibly dull and very out of character for both sides. The intent may have been to show the frustration of the situation Sisko was having to deal with, but all it does is frustrate the reader. Continuity-wise, there's fortunately not much that goes off of DS9 Canon, so it at least works in that respect. After reading this I still can't decide if the premise of this book was good or bad. I mean setting the lion's share of the plot on a game of poker is a bit much. I have yet to like Nog or Jake in any of these novels, maybe it's their youth that is throwing me. I believe Jadzia is so underused, but the again I'm sure there are entire books devoted to Dax and the Trill. Because of a line in the book, and onscreen flirting, I believe that Bashir is bisexual. As with all my kindle books I have highlighted a few passages that I thought were funny, insightful, or just interesting. Here they are. "The answering voice was deep and war, with a trace of humor. Bashir felt a heat that had nothing to do with the environmental controls run through his body. He whirled. Commander Benjamin Sisko stood at the door, hands clasped behind his back, his normally trim uniform marred with smoke stains on one sleeve." "Odo loved to hear Quark whimper." "Poker is a game of skill for liars and cheats,"
"She had snapped at him a quite Dax-sort of way." "But Nog didn't like cake--at least, not chocolate cake. He always complained that it didn't crunch and that it had been dead for too long to taste good." I really enjoyed this book. Perhaps all the more so because I wasn't expecting to. I started this book late in the evening after a long day at work, intending to read the first chapter or two and head to bed. This book did a great job of catching and keeping my attention, as well as keeping the suspense going right up until the end. The characterization and interactions all seemed very believable and interesting. I was worried my lack of poker knowledge might I really enjoyed this book. Perhaps all the more so because I wasn't expecting to. I started this book late in the evening after a long day at work, intending to read the first chapter or two and head to bed. This book did a great job of catching and keeping my attention, as well as keeping the suspense going right up until the end. The characterization and interactions all seemed very believable and interesting. I was worried my lack of poker knowledge might make this book a bit difficult or dull for me, but that wasn't the case at all. Reading this novel felt just like watching a mediocre episode of DS9. Not bad not great either. A pretty simple two-part plot; Quark hosts a poker-tournament and Odo ends up playing, meanwhile Sisko and the crew at Ops save the station from a space-quake of unknown origin and prevent (once more) Bajorans and Cardassians from starting a war. The poker-bits were interesting, the side-plot of the poker-playing murderer was totally lame. Read this if you really love Trek. strong characterization, decent dialogue (including tons of sass from sisko, odo, garak, & more), reasonably interesting plot(s), & a handful of jadzia/kira and garak/bashir shippy moments. better than most gen fanfiction i've read (which certainly seems to be saying something for a lot of genre fiction) (ok actually there are totally fic authors out there who set the bar REALLY high) (this review is so embarrassing). Boring as sin bottle show story revolving around a poker game (yes, a poker game), another murderer on the station and entirely too many call backs to TNG for no good reason. Characterizations are off from the final televised product while none of the three plot lines is engaging. The entire cast gets something to do, more or less, but that simple isn't enough. Wow, fire the editor who did this! Other than that it's a fun little story. However it is odd, while the station is falling apart, Bashir and Odo are playing poker while being inconvenienced by the lights flickering. A Quark and Odo centred storyline. There's a big Poker game, some murders and the station is in trouble. Murder seems to be a common occurance in the books so far. All the characters act how you think they should, and this could make a decent TV episode. A good read. This book is exactly what I remember the early DS9 books to be: very plot-oriented so as to get around the fact that we don't really know who the characters are, with lots of references to TNG to establish the newbie's pedigree. A quick, fun read - definitely better than the last one. And hey, Garak's in it, so I'm happy anyway. Not the best StarTrek literature, but it was ok, especially towards the end. Perhaps poker players will like it more. Had a few amusing bits, but mostly it was kinda boring and I lost interest. Kristine Kathryn Rusch and Dean Wesley Smith use the common pseudonym “Sandy Schofield” for a part of their collaborative works.